...Set: Supernatural 6x02 "Two and a Half Men"
I have to say, after last week's premiere, I was a little bit skeptical about this season. Something felt a little bit off. But tonight, I would say many of my worries were assuaged. The funny was back, and Sam and Dean felt more normal. I suppose it was to be expected that they wouldn't be "normal" last week, but I hope you get what I mean. On to the recap at hand! Sam and the Campbell Clan are on a case where couples are killed and their babies stolen. They don't know what is doing the stealing, only that it's not a demon or a ghost. 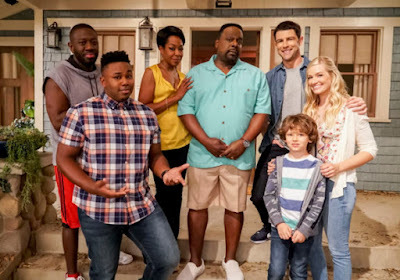 They figure out that there's a connection with the security company the families all used, and that there's another family fitting the demographic still alive. They decide to stake out the place, only things don't go quite to plan. Sam ends up walking in on the dead parents, fighting off some kind of beastie that stings at silver, and ending up with a baby on his hands.Meanwhile, Dean, Lisa and Ben have moved after all of the djinn hoopla, which has put Dean on a kind of hunter high alert, making him not only jumpy, but snippy with Ben, who was snooping around in the Impala's trunk and suggested Dean teach him the ropes. And then who should call him up but Sam, asking for his help with this whole baby business. And therein followed some baby high jinks that I loved. These boys have no idea what to do with babies, and it shows. Only Dean has learned a little something after living a more normal life for a year. A seemingly kindly old lady offers to help them out while the baby is crying to high heaven in a grocery store, but it turns out that lady is actually a shapeshifter, and they just barely make it out of there. But the shifter sees Sam's license plate and will surely be able to track them down. They hunker down in a hotel to figure out their next move (and also a moment for Sam to basically tell Dean that what he's doing with Lisa & Ben is very similar to what John did to them, despite his best intentions), which turns out to be going to interview one of the dad's, who happened to survive, because he and the mother were, I think, separated, because she cheated on him and got pregnant. Only she said she never cheated. And do you know what that means? A shapeshifter posed as the husband and got the lady pregnant! Sam is just calling up Dean to inform him of this news when the baby suddenly goes kapoof and shapeshifts right there! Yep, it's a shapeshifter baby. 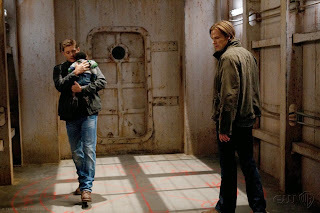 Sam suggests they take the baby, who they have hilariously dubbed Bobby John, to Samuel and the Campbells. 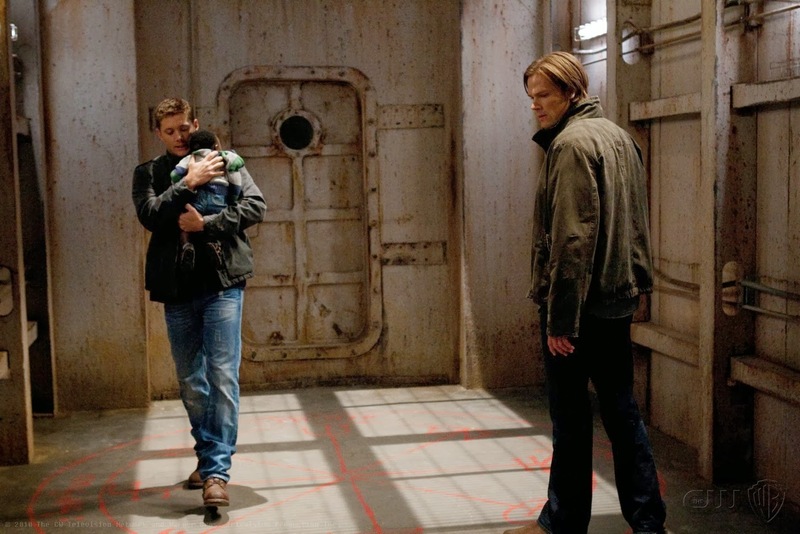 Dean is not so sure about this plan, because he thinks they will likely kill little Bobby John when he's still just a wee baby. But they go to the Campbell compound anyway. Samuel suggest they raise the kid and is all ready to give it to Christian, even though Dean is not at all happy about this plan, when a shapeshifter crashes the party. Sam and Dean hide down in the basement with Bobby John while the Campbells work to fight off the shifter, who has disguised himself as Samuel. He kills off the most silent of the Campbells, and nothing the others do seems to work to stop him. Down in the basement, the shifter shows up, gussied up like Sam. Sam and the shifter fight very briefly before the shifter flings Sam out of the way (quite a feat considering how large he is) and then shifts straight into Dean without any of the shedding skin grossness, more like an insta-shift. Dean tries to put up a fight, but there's no stopping this guy, who takes the baby and goes. Why he wouldn't just kill everyone is a mystery, but whatever. Our heroes need to come back next week so I suppose logic goes out the window sometimes. Anyway, they figure that this super shifter must be what they are calling the Alpha, the one who created all the shifters. But why are they taking babies? Remains to be seen. Also, Samuel has a mystery phone call with someone who tells him to find the alpha shifter. Hmmm. Just who is Samuel talking to?? After the dust has settled, Dean goes back to Lisa and Ben. He confesses to her that he doesn't know what is the right thing to do, because the yelling and everything is not what he wants to be doing. Lisa has the idea to let him have both worlds. He can't stay there, because it's not him, despite him saying he wants to stay (I think he wants to want to stay, but he kind of doesn't at the same time), but that doesn't mean it has to be one or the other. Basically, she left it open for him to go off and hunt and then come back to them when he can. Wow, she is very accommodating and understanding! Could she be the perfect woman for Dean? It would seem so. And with that, Dean yanked that dusty tarp off the Impala, barely suppressing a grin, and the engine roared into the credits. Ah baby, so good to hear that purr/roar/grr. - Samuel made a comment about not knowing about Sam sometimes, and Sam agreed with him. Curiouser and curiouser. - How much of Lisa and Ben will we actually be seeing throughout the season? I'm SO glad they didn't have them killed or Dean just leave them. - Who is Samuel working with? Good? Evil? - Though Sam seemed more like Sam, there is definitely something up with him. Is it just recovering from his stint in Hell, or is it something else? - Is it terrible that I kind of loved how Christian brought up Dean's time in Hell? And how would they know what he did unless Sam had told them, hmm? Also, for anyone interested, I'm hosting a giveaway. Check it out!